A web app for finding a rating scale between two arbitrary things. 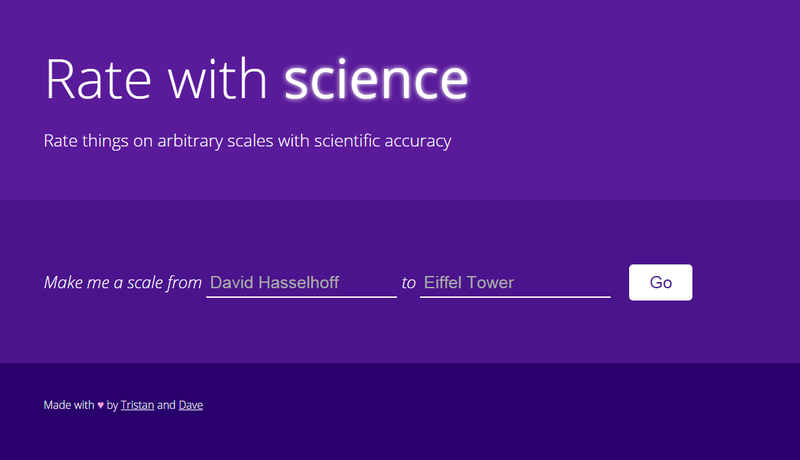 Ever wanted to rate something on a scale of David Hasselhoff to the Eiffel Tower? Well now you can. This project was a long time coming. In our first term in Waterloo, me and Tristan would joke about rating things on odd and arbitrary scales. Being typical SE and CS students, we thought, "we could make a program to do this." We thought about creating a hackathon for silly and terrible ideas like this so we'd have an excuse to implement it, but it didn't materialize for a while, so we just sat on the idea. 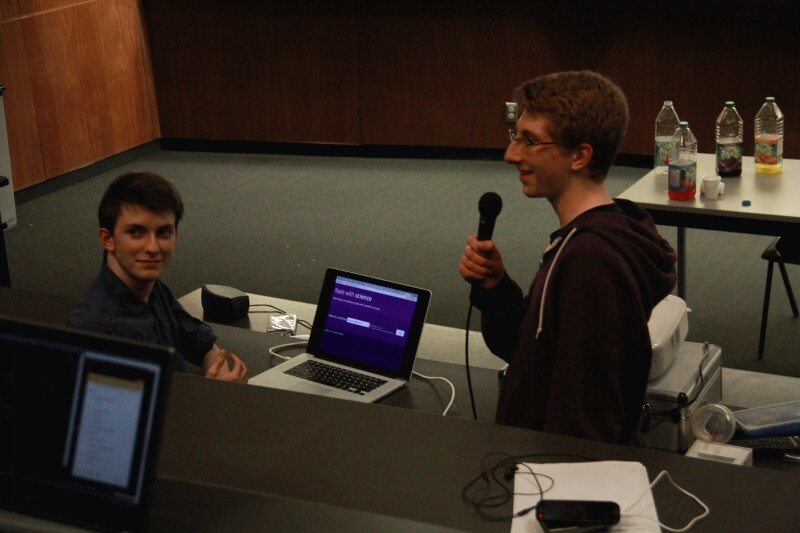 But then, recently, TerribleHack was organized for real and actually happened. We decided to go and actually make this. Tristan made a graph database of Wikipedia to use to find scales. A scale is essentially a path from one Wikipedia page to another, with bi-directional paths (ones where pages link back to each other instead of a one way link) are favored. He initially wrote the backend in Rust, but after some issues with the web server came up, he made the web server part in Ruby instead. At a Waterloo CS Club Code Party, the backend was rewritten in Nim to make everything consistent. More info on the backend can be found in the GitHub repo. Meanwhile, I was working on the frontend. I hadn't worked purely on the frontend for a while so once all the AJAX requests were hooked up I had some fun making the CSS as pretty as I could. Everything has a transition, many of which are more than simple fades. I'm really pleased with how it turned out. Rate with Science won the Actually a Good Idea award at TerribleHack, so I'd say the project was a success.